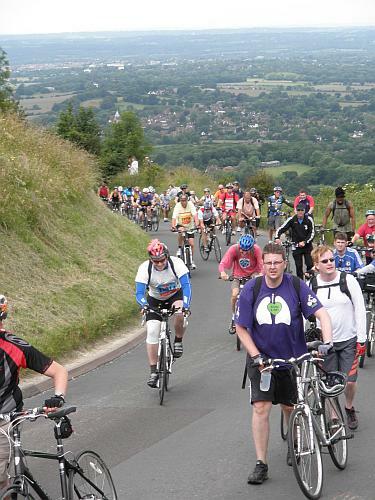 Ditchling Beacon is the high point of the London to Brighton Bike Ride each year, in lots more ways than one. A whole year of training is finally distilled into one breathless blur of uphill climb. 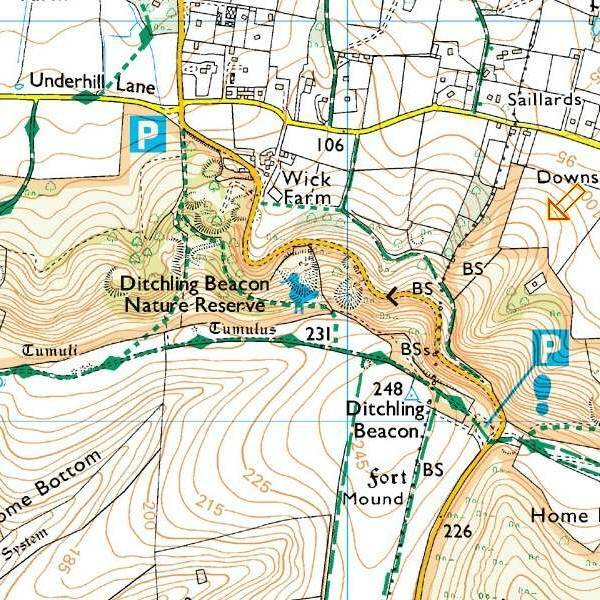 And no matter how many hills I’ve toiled all winter, it never seems that success on Ditchling is guaranteed — because it’s the toughest ascent I do. 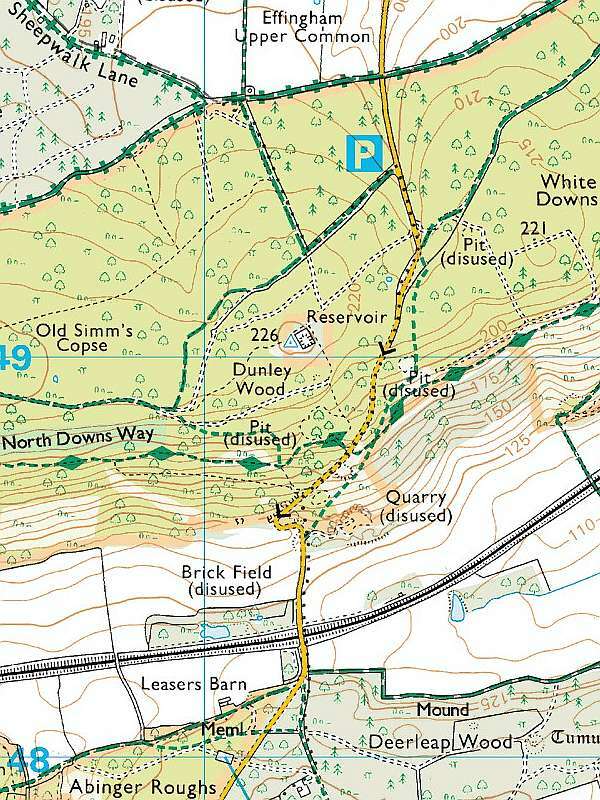 Here’s a map and a profile of the hill, and a comparison with White Down, the steepest climb in the Surrey Hills close to where I live, and the last training test I do before setting off to Brighton each year. Base: 88 m. Top: 226 m. Vertical: 134 m.
Length of climb: 1.0 mile / 1.6 km. Average gradient: 8.4 %. Maximum: 16.1 %. Base: 118 m. Top: 213 m. Vertical: 95 m.
Length of climb: 0.6 mile / 1.0 km. Average gradient: 9.5 %. Maximum: 19.3 %. The key to Ditchling is its length. 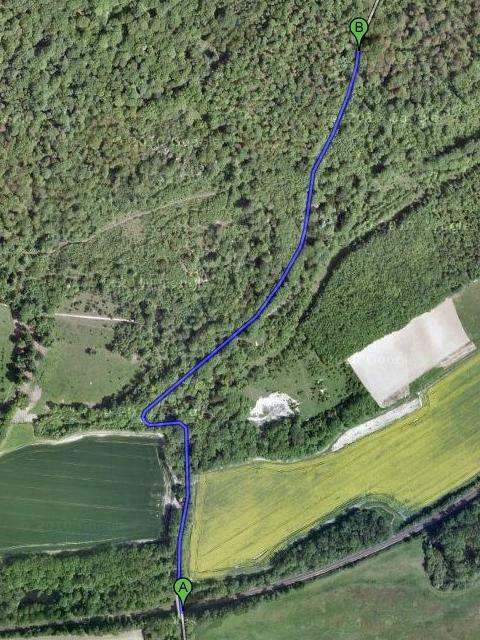 White Down has steeper pitches in its dark and ancient woods, which hide a World War II pill box beside the road as well. But Ditchling keeps on climbing into open sky when the strength of legs and will are fading. You can see the sea and all of Sussex from atop the Beacon. Eleven months of training all come down to eleven minutes to crest the climb. And it’s still the peak of any cycling year. 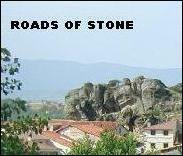 This entry was posted in 2010, cycling, summer, Surrey and Sussex, training. Bookmark the permalink. Well done on the Brighton ride, Roads. I did it myself one year when, conveniently, I lived in Clapham. It must have been 1985 or 1986, and I’d not ridden a bike for about 12 years. I borrowed one 2 days before the event, and presumed that wobbling to Balham and back the day before would be perfectly adequate preparation. But we made it somehow. Ditchling Beacon I remember well. Alas, there was no possibility of riding to the peak without a cardiac seizure, so it took me rather more than 11 minutes. Thanks for the memory. Perhaps I should aim to do it again in 2011, 25 years on. Nice page and comparison. 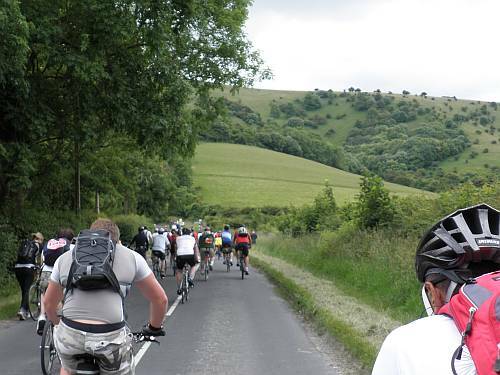 I have to say having done Ditchling in this years London to Brighton, and White Down yesterday as part of the Cycling weekly Sportive, I would class White Down as much much tougher. Having said that we did hit it after 73 miles of ride and that, coupled with Leith Hill before it and knowing we had to do Box Hill afterwards, probably made it feel even worse as physically I was pretty much a wreck by the time I got to it. Fully agree with that. I live in Sussex and am well used to the hills here. I also rode the Cycling Weekly Sportive and can confirm that White Down was an absolute pain. Especially, as you say, after all those miles and having just climbed Leith Hill. It took a lot of will power to keep on grinding out up there. I felt like it wasn’t going to end. The only good news was that Box Hill then seemed like a mere gradual bump. Well done, Mike, and best wishes to Worthing Excelsior. It’s good to hear that White Down has a fearsome reputation as it always seems a challenge. The climb divides itself into three steeper pitches with a little respite in between — although it’s steepest near the beginning, naturally enough the hardest stretch is right before the top. I stretched my gears on Box Hill after the announcement of the London 2012 Olympic Road Race course earlier this year. As you imply, it’s long but not especially steep. That said, the climb is wide enough for a major road race convoy, and the views along the way are worth the trip. 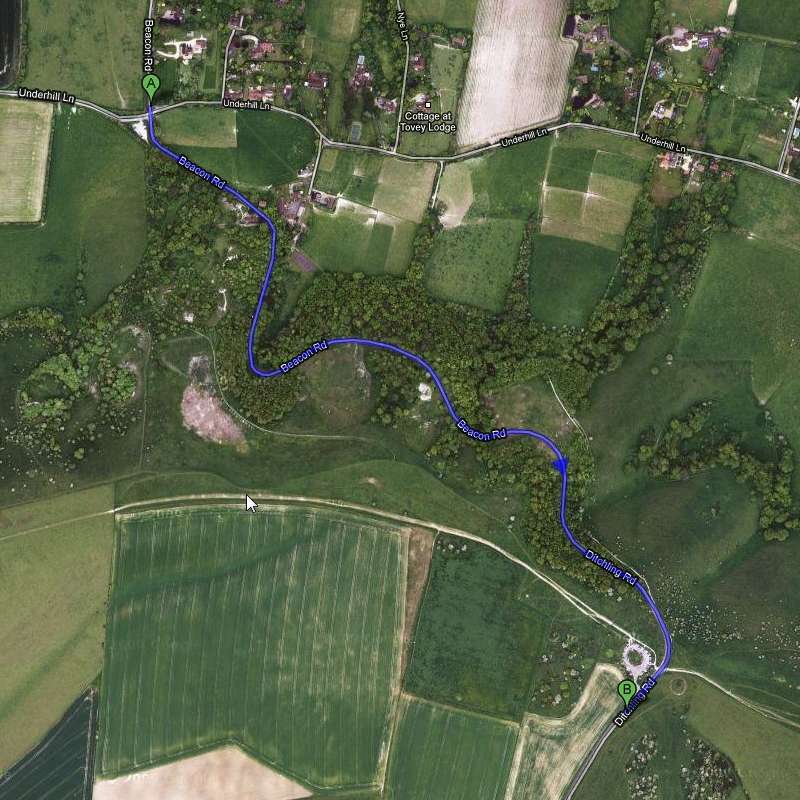 On that trip I found the hill from Dorking up to Ranmore Common much tougher, but that came later in the ride and the legs were tiring out by then. Sounds like you’re very familiar with White Down. I couldn’t have told you that it divides into three steep climbs. For me it just seemed like one long savage grind. The Ranmore climb didn’t bother me at all on the sportive but it came right at the start when the legs were fresh. Having paced myself to get inside the gold award time I was feeling heavy legged by the time that I got to White Down. The 18% sign part way up was somewhat of a demotivator! Coincidentally I rode Ditchling Beacon again this Monday. Bad idea. I was a grey day indeed. That in itself would have been no problem but as I climbed from Ditchling the mist got thicker and thicker. By the top everything (including me) was invisible. You couldn’t see the car park from the roadside. I rather wished that I was somewhere else and didn’t enjoy the return descent at all. They’re still both short-but-sharp hills guys! 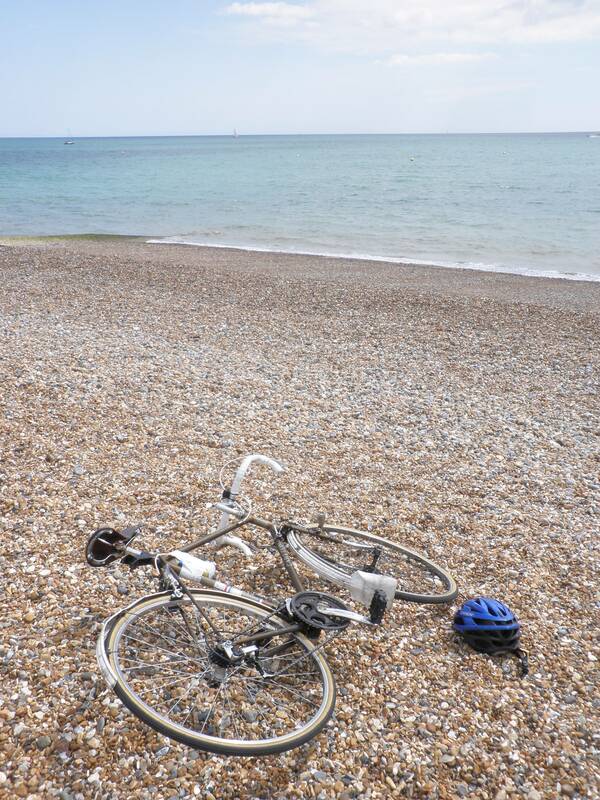 I rode up the Beacon on the London to Brighton when I was 13 years old, no problem. See what I said about the weight of bike and load, haha. Unfit is true, mind-you. I did White Down as my first sportive ever, last Sunday. At the hairpin turn I got off and pushed, because as I kept telling people, I know my limits. It was horrible even pushing. I thought I was reasonably fit – I was oh so, so wrong. I am trying to tell myself that at 48, being short, overweight and with no fitness record whatsoever, I did well to finish… But I am grateful to know that there isn’t much that is worse in my cycling future. Here is a book about climbs in Sussex and Surrey. I did White Down Lane in April 2015 after having done Leith. They are both tough. White Down does not seem to let up after the hairpin. Managed to get through them though at one stage my speed on White Down was 0.9mph. My Garmin actually switched off thinking I’d stopped!